To get from Sheremetyevo airport to Moscow take Aeroexpress train to the metro station "Savelovskaya" (see train schedule ). From Domodedovo airport you can take Aeroexpress train to "Paveletskaya" (see train schedule here ). From Vnukovo airport you can take Aeroexpress train to "Kievskaya" (see train schedule here ). 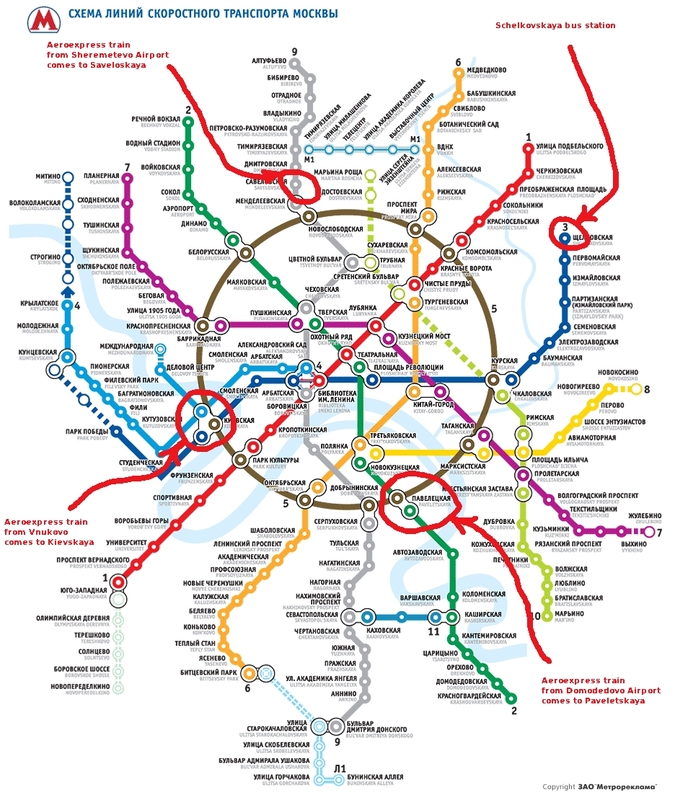 Once you get to the Moscow metro (subway), you should go to the station "Shchelkovskaya", the terminus of the dark blue line. At "Shchelkovskaya" take the exit near the first (head) car, go upstairs, take the right turn, then go to the left, and then upstairs. There is a big bus station near "Shchelkovskaya". There you take express bus 320 (Moscow-Chernogolovka) or 360 (Moscow-Dubrovo) to Chernogolovka. They depart from the platform 11 (near the entrance to the Bus Station). 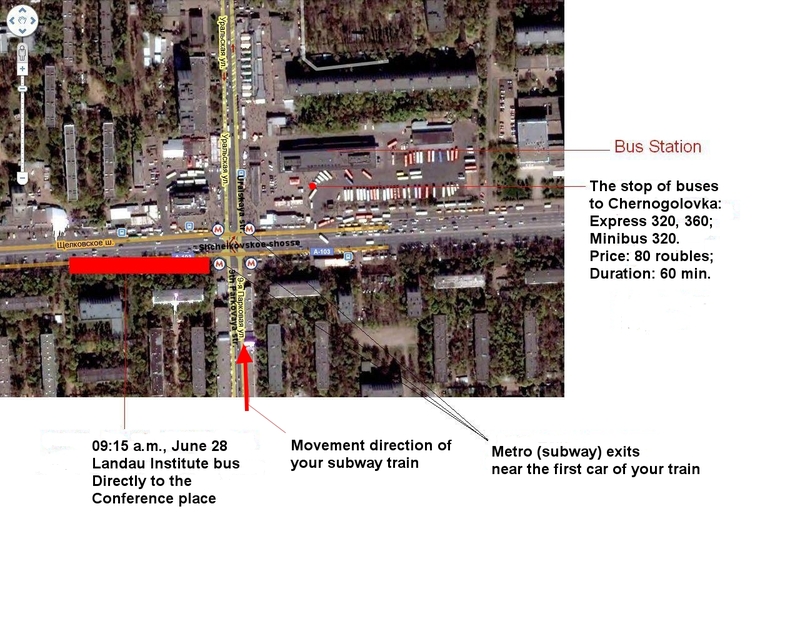 There is also stop of the mini-bus 320 (Moscow-Chernogolovka) near this point. Please, buy the ticket from the driver. Thicket's price is 80 roubles. If you want to take a taxi from the airport, go to the counter in the arrivals hall. Note that the ride to Chernogolovka (located near the town of Noginsk) can be rather expensive (about $150). Institute Bus: Those participants, who arrive in Chernogolovka on June 28, 2009 in the morning, may use the bus of the Landau Institute. It will depart at 9:15 a.m. from the ''Shchelkovskaya'' subway station and follows directly to the conference place in Chernogolovka. Use the exit near the first car of your train. Go upstairs, turn left, pass through the turnstiles, and then turn left in the underground passage. Again go upstairs and turn right in the street. The map on how to find this bus stop can be found here. Please, note that the bus will be parked at a space free from other vehicles, so its actual stop can vary, see the map. The bus will carry the label "LANDAU INSTITUTE". 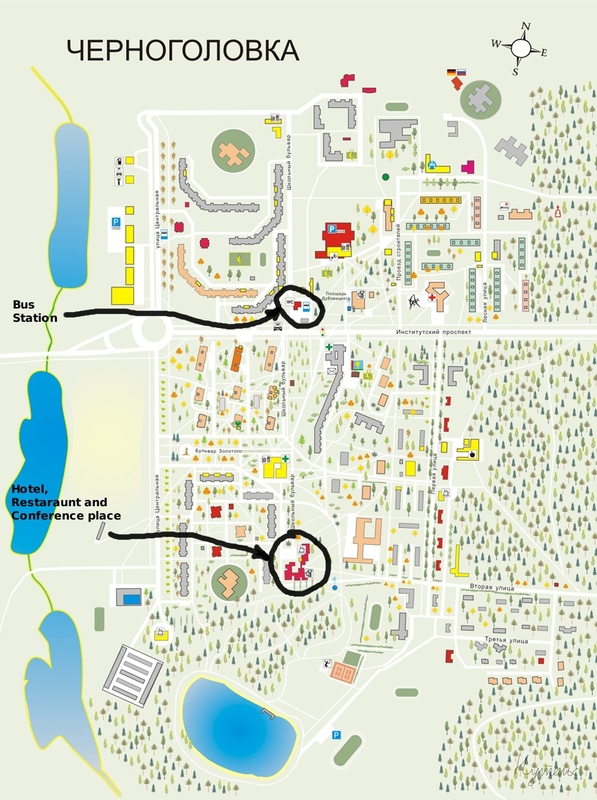 The disposition of the Conference-related places in Chernogolovka is here.